1970-79 U.S. National Christmas Seals, Sheet Collection, full gum, F/VF, MNH. Issued each year at Christmas by the National Tuberculosis Association (NTA). Dealer stock, not from a collection. Pristine, full brilliant colors, full gum, shipped flat. 1970-79 U.S. National Christmas Seals, Sheet Collection, full gum, F/VF, MNH. Issued each year at Christmas by the National Tuberculosis and Respiratory Disease Association (NTRDA) 1970-73, and the American Lung Association (ALA) 1974-79. Ten (10) full sheets - one sheet for each year: 1970, 1971, 1972, 1973, 1974, 1975, 1976, 1977, 1978, and 1979. 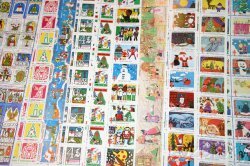 This is an excellent and economical way to begin or enlarge a Christmas Seal sheet collection.